This is a beautiful Dan Mask from the tribal people of Liberia. Famous for their masks, the Dan believe that spirits, known as "Du," live in the forests and manifest themselves to humans in masks and masquerades, instructing and sustaining the Dan in life. Very fine and quite interesting wooden mask from the Dan peoples of Cote D 'I voire west Africa. A Carved wooden mask with a highly stylized form and wonderfully exaggerated facial features. This is an antique Dan tribal people hand carved and used wooden Bagle dancing mask. 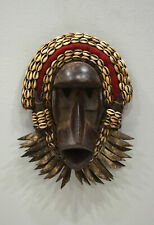 This antique Dan mask was collected from the Ivory Coast, Africa. The Dan people live in the western part of the Ivory Coast and extend into Liberia. Title Dan Guere War Mask Animal Horns Liberia African Art. A very unique and beautiful piece. Country of Origin Cote d'Ivoire, Liberia. Harley, G.W., Notes on the Poro in Liberia, Papers of the Peabody Museum, Archaeology & Ethnology, XIX, No.2 (Cambridge, MA, 1941). Another African mask from my personal collection. This mask is from the Dan tribe of Africa. Expertly carved with interesting carved raised details under both eyes and on the forehead. Old rope netting attached by antique hand-made nails (see last photo). Very fine and quite interesting wooden mask from the Kran (Dan) peoples of Cote D 'I voire / Liberia, west Africa. A Very Impressive Old Carved wooden mask with an elaborate and exaggerated face and form. Both the Dan and Wee have dynamic masking associations known as Poro that initiate the young and regulate society. Female masks are rounded or oval, narrow eyes and finely delicate non-challenging features, whereas the male mask is larger in size, grosser in proportions, with an open and challenging mouth with teeth, tube-like eyes, fur and raffia. Title Dan Guere Mask with Iron Studs African Art. This is a well-carved mask from the We-Kran people who live in the southern part of the Dan region. This mask features a chimpanzee-like face with very angular details. Title Dan Guere Mask Beard Brass Bells African Art. People Dan, Guere. The surface of this mask shows significant traces of use. If truly Dan and with open round eyes and teeth in mouth, this mask would be identified as a Zakpai ge’ mask, an active and aggressive mask that serves a number of functions. Title Dan Guere Mask Beard Shells Spikes African Art. People Dan, Guere. The surface of this mask shows significant traces of use. If truly Dan and with open round eyes and teeth in mouth, this mask would be identified as a Zakpai ge’ mask, an active and aggressive mask that serves a number of functions. Deangle dances for all to see as ‘she’ entertains and instructs the village in peaceful pursuits. Each Deangle mask reflects the skill of the artist and taste of the patron and while local variations occur there are long established criteria for Deangle that reflect a long standing Dan cultural aesthetics and styles. Famous for their masks, the Dan believe that spirits, known as "Du," live in the forests and manifest themselves to humans in masks and masquerades, instructing and sustaining the Dan in life. When during a dream a male was instructed by Du to dance a mask, he would commission a carver to make a mask for him. Very fine and quite interesting wooden mask from the We (Dan) peoples of Cote D 'I voire west Africa. Each “singer” masquerade has a “life history.”. Passed down from one generation to another within a family lineage, a “singer” builds its language skills and repertory of texts as it increases in age, reputation, and sanctity. The head is topped with two dancing primates holding hands. The back of the mask shows residues and signs of age and use. Its very uniqueness combined with the size and quality of carving argues for a place in a major collection. A very fine mask. DAN - IVO. Famous for their masks the Dan believe that spirits of the wild known as Du manifest themselves in masks and masquerades to humans instructing and sustaining them in life. When during a dream a male was instructed by a Du to dance a mask, he would commission a carver to make a mask for him. It has really incredible painted detailing around the eyes. I HAVE A SPECIAL LIST OF COLLECTORS THAT I KEEP A SPECIAL EYE OUT FOR WHEN I'M OUT AND ABOUT. Title Dan Firewatch Mask Zakpai Ge Braided Beard African Art. This mask belongs to the category of ‘Zakpai ge’ mask, an active and aggressive mask that serves a number of functions. In the past it also served as a war mask. The mouth area is large and opened with a bit of leather attached. The mask has two large hands partially coving the face. The surface of this mask shows significant traces of use. Country of Origin Liberia. Really incredible and very large piece. The detailing on this item is exceptionally done and the size is really unique. People Dan / We, Wee, Guere. This well-used example of We, Dan or Kran masks is an interesting piece with a strong symbolism. Its very uniqueness combined with its size and quality of carving argues for a place in a major collection. When during a dream a male was instructed by Du to dance a mask, he would commission a carver to make a mask for him. Deangle dances for all to see as "she" entertains and instructs the village in peaceful pursuits. Vintage/antique Dan Mask Liberia African Art mask. It appears to have two recent nicks on nose. Protruding Forehead is a characteristic of Dan masks. Shipped with USPS Priority Mail. Really incredible and very large piece. The detailing on this item is exceptionally done and the size is really unique. it can be worn over the entire head. It is very unigue and beautiful. Representing a Ge, who is a spirit, this mask would serve as a visible symbol manifesting power, principles, and as a "spirit of the bush" to maintain social order, initiate the young and punish wrongdoers. It is known however that the Dan were heavily preyed upon by slave raiders in the 17/18th century, and the creation of Liberia in 1847 was marked by the repatriation of large numbers of them. The ability to accumulate wealth and prove one's ability are highly prized by Dan society, and the belief is known as the "tin.". Title Dan Guere Mask with Beard African Art. The surface of this mask shows significant traces of use. If truly Dan and with open round eyes and teeth in mouth, this mask would be identified as a Zakpai ge’ mask, an active and aggressive mask that serves a number of functions. Vintage African Dan Mask Carved wood Art antique Côte d’Ivoire Ivory Coast 13.5"
The face has two pointed noses and a very large open mouth. The surface of this mask shows significant traces of use. If truly Dan and with open round eyes and teeth in mouth, this mask would be identified as a Zakpai ge’ mask, an active and aggressive mask that serves a number of functions. The Dan people, who live in Liberia and the Ivory Coast, are governed largely by secret societies. Famous for their masks, the Dan believe that spirits, known as "Du," live in the forests and manifest themselves to humans in masks and masquerades, instructing and sustaining the Dan in life. People Dan or Guere-Wee(We). Overall Condition Good. Most ofÂ our pieces have spent decades on at least two continents, and have been treasured by several owners. W. Siegmann and Cynthia Schmidt, Rock of the Ancestors, (Suacoco, 1977). People Dan, Wee, Kran or Guere. Both the Dan and Wee have dynamic masking associations known as Poro that initiate the young and regulate society. Female masks are rounded or oval, narrow eyes and finely delicate non-challenging features, whereas the male mask is larger in size, grosser in proportions, with an open and challenging mouth with teeth, tube-like eyes, fur and raffia.